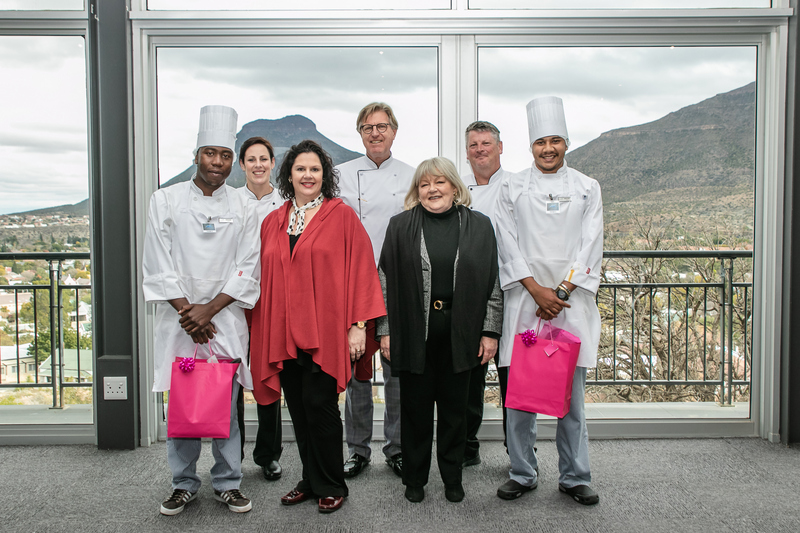 There was a palpable air of excitement when the Class of 2018 greeted their special guests arriving on campus for the 4th annual Fab Chef competition of the SA College for Tourism (SACT) that took place on the beautiful morning of 21 August. 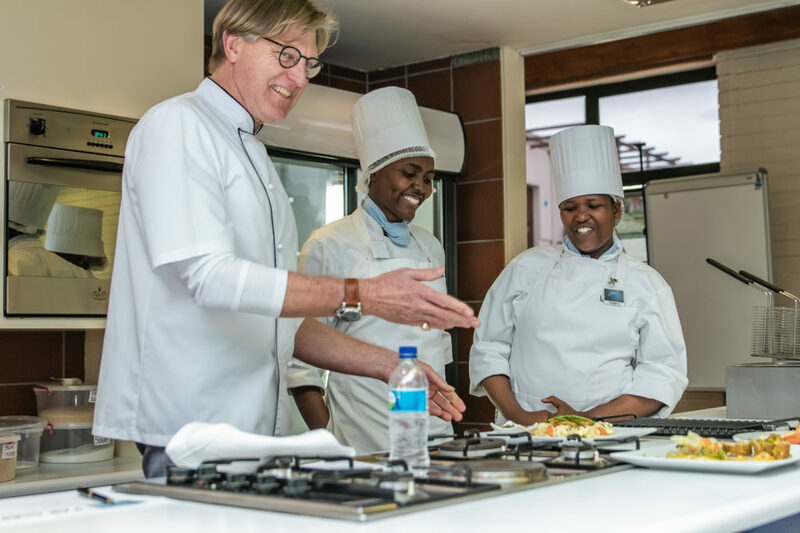 For the demonstration given to all the students of SACT preceding the competition, Executive Chef of Fleur du Cap Estate, Chef Kevin Rottcher, and Sous Chef, Ian Wallace, compiled a brand new recipe book. Most of the graduates of SACT find employment at lodges and guest houses and for this reason, the chefs decided this year to demonstrate the preparation and serving of typical lodge cooking recipes which could be easily be adapted from a meal for two guests to a function for a large number of guests. 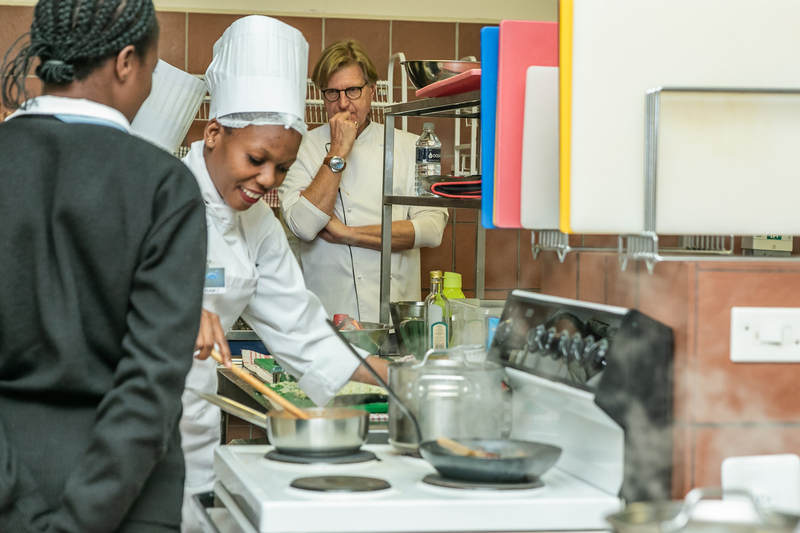 The students were inspired by the professional chefs’ cooking demonstration. The recipes were carefully selected, planned and tested before printing the recipe book. 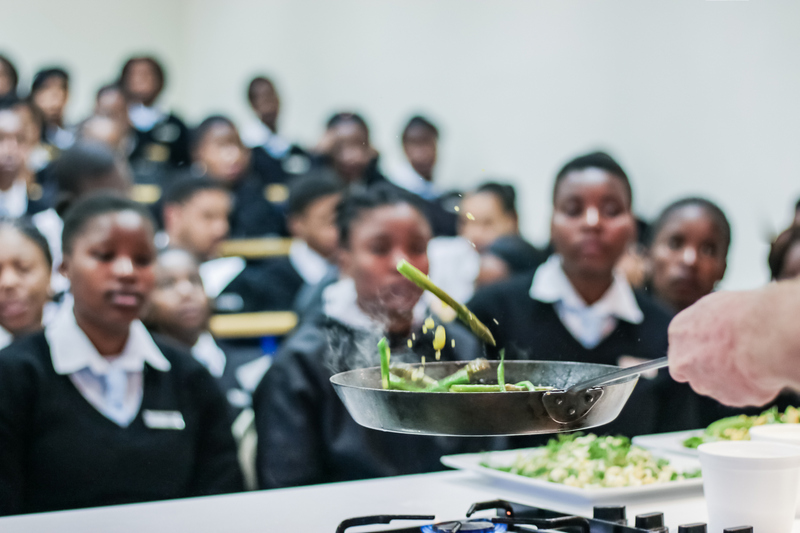 Students were obviously thrilled to see these two veteran chefs in action with the recipes, hanging on to every word of explanation and every little trick of the trade they offered throughout their demonstration and peppering them with questions along the way. The eight competing chef teams. 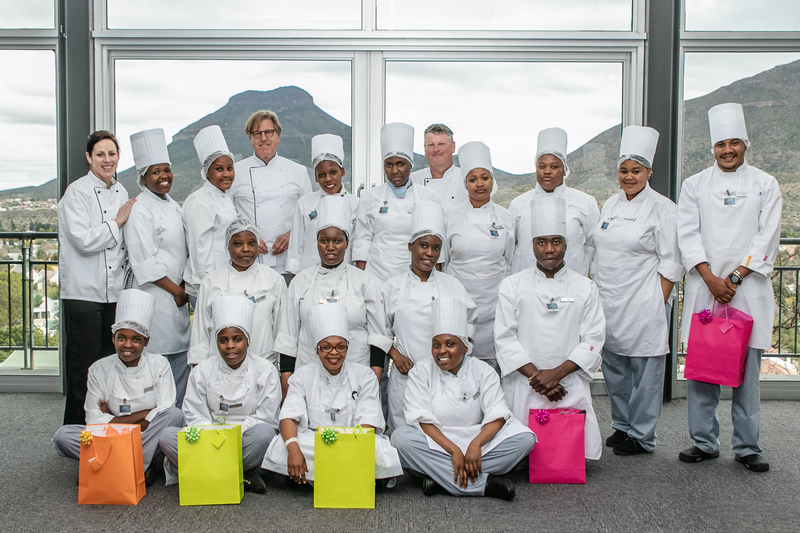 Eight pairs of chefs in training competed for the Fab Chef 2018 title which followed the demonstration. The competition kicked off with the opening of mystery boxes filled with a strange combination of ingredients: Pork fillet, cauliflower, green apple, curry paste and Corn Flakes. The teams were given 15 minutes to plan their dish which they had to prepare and plate thereafter within an hour. Teams were allowed to use any other ingredients from a pantry and fridge specially set up for the competition. The rest of the students were able to watch how their alma mater battled it out in the training kitchen on a big screen television, connected to a video camera. This permanent fixture in the demonstration kitchen was generously sponsored by Remgro Limited after the 2017 Fab Chef competition and made it possible for all to share in the fun and adventure as the participating teams hurriedly planned their dishes and then proceeded to cook up a storm amid very loud and enthusiastic encouragement from their supporters. Chef Kevin and Chef Ian were very complementary of the efforts and innovative ideas of all eight teams. Five judges including Chef Kevin and Chef Ian tasted all eight dishes and awarded marks for the taste, presentation, colour combination and the use of ingredients. The only male team who entered, Brentino Moses and Bongani Sambo, form the Western Cape and Mpumalanga respectively, came out on top with their Corn Flakes and bread crumb crusted pork fillet, served with pureed cauliflower, apple and curry paste with glazed brunoised carrots as a side dish. The third placed team of Nqabakazi Yaya and Lindelwa Kasper, both from the Eastern Cape, received an apron embroidered with the SACT logo as well as a paring knife each while the runners-up, Mpho Pulinyane and Kamohelo Motaung, both from the Free State, also received an embroidered apron as well as a set of paring knives. Fab Chef, again a very successful educational, yet fun-filled day, was concluded with wine and refreshments served to the student and their guests to celebrate the success of the day and to thank their guests, which included Mrs Mariza Lubbe, Remgro Limited Director and Head of Corporate Social Investments and SACT Board Member, Mrs Jennifer Preller, for their participation and for making the event possible.